“Now for the library.” That was The Bates Student’s reaction to the fall 1895 opening of Roger Williams Hall, seen here from the steps of Hathorn with scaffolding still in place. The building in front of the Bill is Hedge Hall — the original structure without its later additions. In the distance, at right, is John Bertram, then home of the Latin Nichols School, a sort of prep school for Bates. 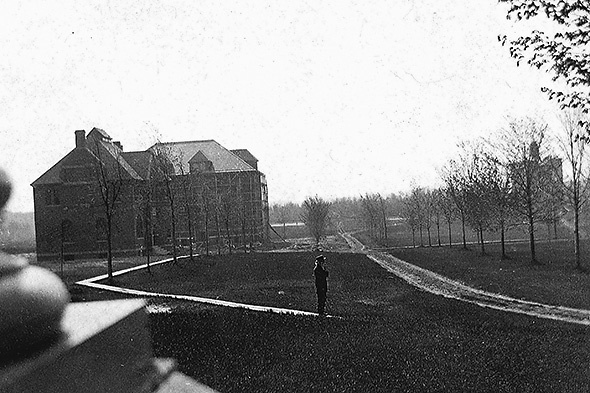 The solitary man at center is Bates’ legendary professor Johnny Stanton, who, according to the photo caption, was waiting for the sophomore class to join him for one of his famed bird walks. School, a training school for ministers sponsored by Bates that closed in 1908. Student-focused buildings — Carnegie Science, Coram Library, Libbey Forum, the Chapel, and Rand and Chase halls — would come in the next 20 years, quickly followed by Alumni Gym and the Gray Athletic Building. This spring, Bates kicks off a $15 million project to renovate and expand Hedge and the Bill into academic spaces. The Bill, a residence hall for most of the last century, will house the language programs, the Off-Campus Study Office, and the Language Resource Center. Hedge, originally a chemistry building then a residence, welcomes the environmental studies program as well as the philosophy and religious studies departments. Like the construction of New Commons, Alumni Walk, and the 280 College Street residence, this project will achieve the equivalent of LEED Silver certification for sustainability, focusing especially on energy efficiency. Both buildings are now horribly inefficient: Their brick walls (wicked heat-leakers) are uninsulated, and heat radiates easily from their roofs, quickly melting snow in the winter. Construction finishes in summer 2011.